Well, it’s back-to-school time and we are thrilled to bring you two pieces of really big news today. Our developers have been hard at work for months now, and we’ve just unveiled a brand-new app for iOS users. The WhiteStar Wizard is available now, for free in the App Store. It’s grid on the go – with WhiteStar’s premium quality data inside. 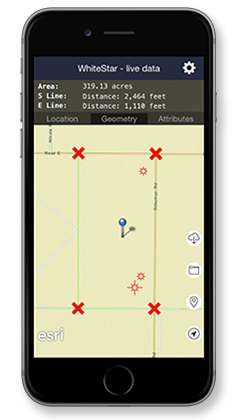 Whether you’re in the field looking for corners or at your desk needing a quick coordinate check, it’s right there on your iOS device. Want basic info on the over 4 million wells in the US? They’re in there too. And yes, it’s FREE – and not just for WhiteStar subscribers. Give it a spin and let us know how you’re using it! Visit WhiteStar Wizard on the App Store. In other breaking news, for the first time ever, we have sourced and released a comprehensive parcel data layer. Coverage is national, and it includes ownership and tax roll information too. Updates will be annual. If your work could benefit from an even closer look at the lay of the land, check out WhiteStar Parcels on our website or get in touch with Adam for more details.